To play this game, players search for pairs of numbers that add up to a given sum. Each file contains four game boards, instructions, and a blank template. Find pairs of numbers that add up to 10. These game boards have an apple theme. Find pairs of numbers that add up to 9. This game has a panda bear theme. Look for pairs of adjoining numbers that add up to 17. This set of four game boards have a dinosaur theme. Search for pairs of adjacent numbers that ave a sum of 11. This game has a turtle theme. Look for pairs of connecting numbers that have a sum of 10. These game boards are shaped like a maple leaves. Players look for pairs of numbers add up to 12. These game boards have hot air balloon pictures. Circle pairs that add up to eleven. This version has a penguin graphic. Look for pairs of connecting numbers that have a sum of 14. 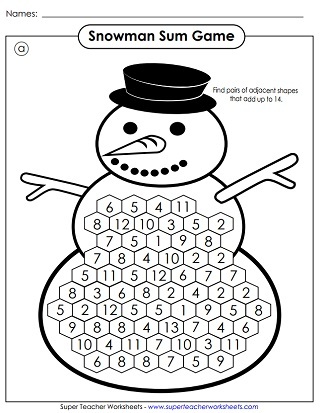 These game boards are shaped like winter snowmen. The sun picture has numbers in it. Circle pairs that have sums of sixteen. Hunt for pairs of numbers with sums of 17. These game boards are shaped like Christmas trees. Students take turns searching for numbers pairs with sums of 13. Find pairs of numbers that add up to 15. These game boards are shaped like pumpkins. Look for pairs of connecting numbers that have a sum of 13. These game boards are shaped like lucky four-leaf clovers. Search for pairs of numbers that add up to 14. These game boards are shaped like Valentine hearts. Practice basic addition, with sums up to 20. 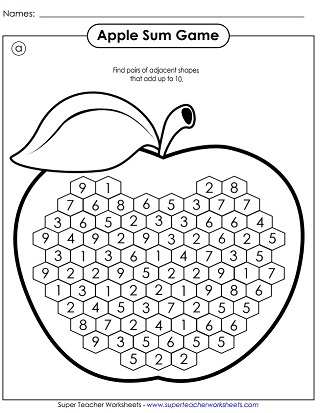 This page has games,drill worksheets, and mystery pictures. Complete the addition square puzzles by solving to find the missing numbers. Solve the basic math problems. 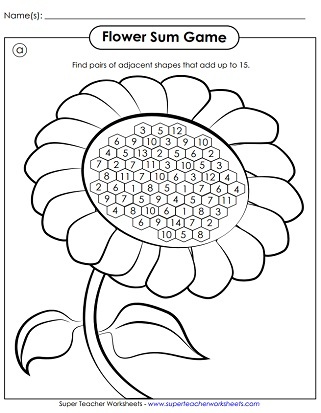 Then color according to the key to reveal a colorful mystery picture.